Palestinians enter Bab al-Rahmah for the first time in 16 years, February 22, 2019. Photo credit: Afif Amira for WAFA. Israeli police detain 60 Palestinians in Jerusalem after protesters and Waqf officials reopened a building in al-Aqsa Compound that Israeli authorities have kept sealed for 16 years. Israeli police arrested around 60 Palestinians from their homes in East Jerusalem late at night on Thursday, February 21, 2018. On Sunday, February 24, Israeli police also seized the Head of the Jerusalem Waqf Sheikh Abdel Azeem Salhab and Waqf Deputy Head Sheikh Najeh Bkeirat. The mass detentions follow Palestinian protesters’ liberation of Bab al-Rahmah, a gate and hall in al-Aqsa Mosque Compound in Jerusalem. Protests to free the area started on Sunday, February 17, after Israeli police placed chains and locks on a gate leading to the area. According to al-Jazeera, the Islamic Waqf, the body that oversees al-Aqsa, announced it would reopen the hall and Sheikh Salhab opened the gate. Palestinians pray in the area of Bab al-Rahmah in al-Aqsa Mosque Compound, February 22, 2019. Photo credit: Afif Amira for WAFA. Israeli authorities sealed Bab al-Rahmah in 2003 citing “security.” It has not been in use since then prior to Friday. 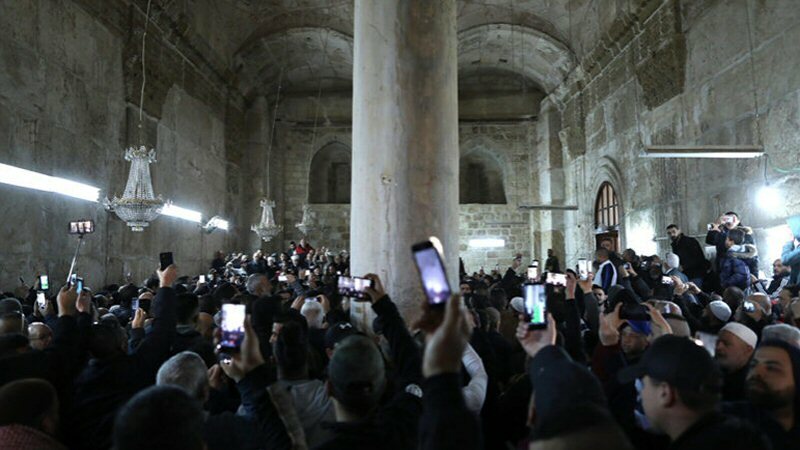 Upon entering Bab al-Rahmah, Palestinians raised the Palestinian flag, chanted national and religious slogans and organized cleanup crews to refurbish the hall. Around 17 of the people arrested on Thursday night were released Friday morning. Some Palestinians gathered at the police station to greet the freed prisoners with sweets. According to the Palestinian News and Info Agency, those who were released on Thursday were issued temporary bans from al-Aqsa Mosque. Sheikh Salhab and Bkeirat are still imprisoned and stand accused of allowing Palestinians to enter Bab al-Rahmah, according to Israeli newspaper Haaretz. The Palestinian News and Info agency reports that Palestinians continue to be arrested in Jerusalem for alleged involvement in the liberation of Bab al-Rahmah.